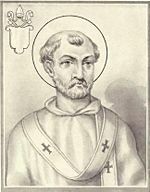 Pope Saint Anterus was bishop of Rome from November 21, 235 to January 3, 236, succeeding Pope Pontian, who had been deported from Rome, along with the antipope Hippolytus, to Sardinia. His reign was a very short one, lasting only 40 days. Tradition holds that he collected and stored various acts of the martyrs, but most scholars today treat this report with skepticism. It is claimed that Anterus was himself martyred under the persecutions of Emperor Maximinus the Thracian. However, while it is true that his predecessor died in exile in the Sandinian mines, there is no evidence for this being the case with Anterus. He was buried in the papal crypt of the cemetery of St. Callixtus in Rome and later made a saint, as were all the early popes. His tomb was discovered in archaeological investigations in the nineteenth century. The Liber Pontificalis indicates that Anterus was a Greek and that his father's name was Romulus. He became pope after his predecessor, Pontian, was sentenced to exile in the Sardinian mines under the persecution of Emperor Maximinus I, known as the Thracian. Nothing else is known of his background, and little if anything is known of his episcopacy, which lasted less than a month and a half. The congregation of the antipope and later saint Hippolytus, who was exiled with Pontian, may have been reconciled with the main body of the Roman church during Anterus' time, but the sources make it equally possible that this reunion occurred either just before the sentence of exile was enforced, or during the time of Anterus' successor, Pope Fabian. The idea of his martyrdom is supported by the fact that his predecessor died in the mines after being exiled under persecution, but more telling is the report in the Liberian Catalogue of the popes that he "fell asleep," a euphemism for a natural death. A later tradition holds that Anterus was martyred for having caused the Acts of the martyrs to be collected by notaries and deposited in the archives of the Roman Church. While this tradition cannot be dismissed out of hand, most scholars today treat it skeptically, since its source, the Liber Pontificalis, is of relatively late date and routinely ascribes to each pope accomplishments that are clearly anachronistic. Anterus was the first bishop of Rome to be buried in the Catacomb of Callixtus, in which many of the early popes would later be entombed. The site of Anterus' sepulcher was discovered by the Italian archaeologist Giovanni Battista de Rossi in 1854, who found some broken remnants of his Greek epitaph engraved on the narrow oblong slab that covered his tomb. A letter once attributed to him is now dismissed as a later forgery. His feast is celebrated on January 3. Duffy, Eamon. Saints and Sinners: A History of the Popes. New Haven: Yale University Press, 2002. ISBN 0300091656. Kelly, John N. D., and Michael J. Walsh. The Oxford Dictionary of Popes. Oxford: Oxford Univ. Press, 2005. ISBN 9780198614333. Walsh, Michael J. An Illustrated History of the Popes: Saint Peter to John Paul II. Bonanza Books, 1980. ASIN B000O9Y9I6. This page was last modified on 22 May 2015, at 20:04.